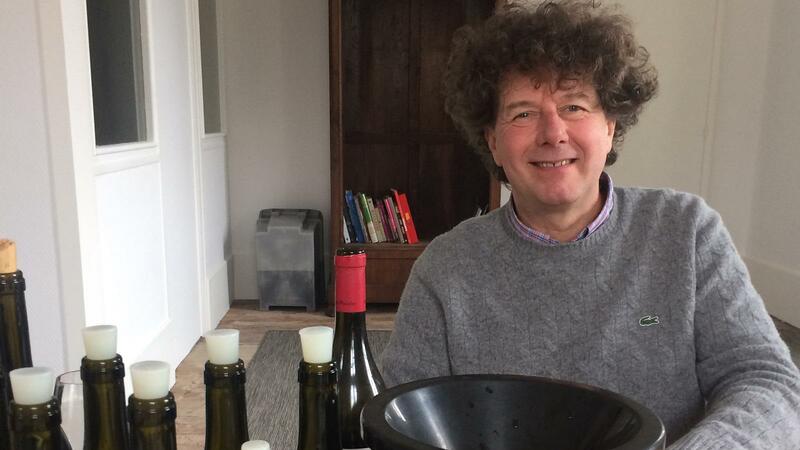 Phillipe Pacalet offered a sneak peek of some of his 2016 reds and whites. My first day tasting the 2016 vintage in Burgundy began in Beaune. Phillipe Pacalet is a micro-négociant producing about 5,000 cases a year from 62 acres of vineyards in a cellar on a small side street in Beaune. We tasted 13 different 2016s from purchased grapes, some parcels of which he farms with his team. He owns a small vineyard in Moulin-à-Vent and also makes wines from Cornas and Côte-Rôtie (first vintage in 2017) in the Northern Rhône. Pacalet is a minimalist, working with organically farmed fruit, vinifying whole cluster with indigenous yeasts and using minimum sulfur. The resulting wines show great clarity and focus, reflecting their origins in variations of clay and limestone soils. The use of stems adds exotic spice notes of sandalwood and incense. The Philippe Pacalet Gevrey-Chambertin 2016, bottled last week, is spicy and aromatic, if reserved, offering cherry and black currant fruit. Nuits-St.-Georges, still in tank, shows even more perfume, evoking sandalwood, exotic spice, black currant, and feels more fluid than the Gevrey. Nuits-St.-Georges Aux Argillas comes from stony soils, despite the name. It's less aromatic, with more earth and meaty, woodsy aromas, yet very fine on the palate, supple and long. The Corton-Bressandes comes from a 2.5-acre parcel with 80-year-old vines. Still in cask, it reveals earthy, animal aromas more than fruit or spice, and is rich, round and juicy, displaying black cherry, sandalwood and spicy flavors. The Clos Vougeot vines are near the south wall, close to Vosne-Romanée. The wine features a darker expression of fruit, black cherry, and meaty iron notes. It's cool, reserved, muscular and tannic, yet balanced, very vibrant and fresh. Pacalet's Echézeaux block escaped frost; he was able to make 5 casks (a normal year yields 6). It leads with a gorgeous nose of spicy cherry, strawberry, earth and graphite, very complex. Elegant, yet firm, it turns austere on the finish for now. Pacalet likes to press his Chardonnays with stems, explaining: "I like to have some bitterness; it's like tannins for the whites." There is a very expressive Chablis Beauroy full of honey, apple and mineral notes on a rich, round frame, underscored by lemony acidity. The Puligny-Montrachet normally comes from two parcels, Les Petites Nosroyes and Noyer Bret, but in 2016 it's all of the former lieu-dit. Light spice, mineral, honey and lemon flavors mark this very fresh, balanced and firm white. The Meursault (Les Grands Charrons and Le Tesson) exhibits honey, apple peel and a touch of verbena matched to a rich texture. Meursault Charmes (Dessus) shows beautiful, smoky, honey intensity set against mineral, with balance and finesse, while the Corton-Charlemagne offers typical austere lemon, stone and chalk notes, all tightly wound.